January 5, 2013, Las Vegas, NV - Newer Technology, Inc. (NewerTech®) announced today that it will introduce its next generation Power2U™ AC/USB Wall Outlet in Other World Computing's (OWC) booth #5812, LVCC North Hall, during the Consumer Electronics Show which begins Tuesday in Las Vegas, Nevada. 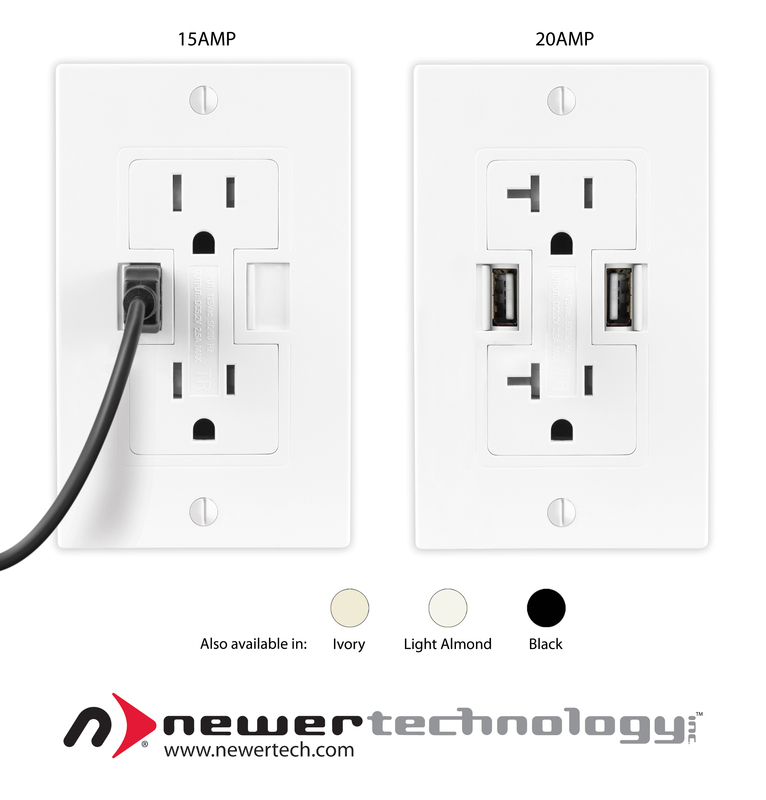 Designed to enhance living and working spaces by eliminating the need for power adapters, the Power2U AC/USB outlet now features NEC tamper-resistant receptacles and is available in a new 20 Amp model for residential and commercial, hospitality, education, and municipal applications. Visitors to the OWC booth will be able to experience the convenience of the Power2U firsthand by charging up one of their USB or AC powered devices. While the new 15 Amp and 20 Amp outlet models feature NEC tamper-resistant receptacles, the Power2U retains its main consumer appeal of offering a clean looking, modern, centralized location for charging/powering USB devices. In addition to being convenient to use, the Power2U continues to provide two energy efficiency features. The intelligent Smart Power design only outputs enough charging power to meet the requirements of the device that is attached. The specially designed spring-loaded Safety Shutters completely turn off power to the USB ports when a connecting cable is removed to prevent "vampire draw". Energy efficient, spring-loaded Safety Shutter design turns power off to USB ports when connecting cable is removed to prevent "vampire draw"
"The Power2U has been a huge hit in homes across the country, and the new 20 Amp model will now allow commercial, hospitality, education, and municipal settings to offer its benefits," said Grant Dahlke, Brand Manager, Newer Technology Inc. "Because USB charging is a universal standard on many devices, the appeal of this product to consumers, hardware retailers, homebuilders, and facility managers is unlimited. We invite CES attendees to visit OWC's booth and experience firsthand the convenience Power2U offers." Priced at $29.95 MSRP for the 15 Amp model and $39.95 MSRP for the 20 Amp model, the enhanced Power2U AC/USB Wall Outlet will be available for ordering by late Q1. The Original Power2U 15 Amp model is available for immediate purchase for as low as $14.99 and $11.50 when two our more units are purchased. For more information on the Power2U and reseller inquiries, visit: http://www.newertech.com/products/power2u.php. For more information on Newer Technology's complete line of accessories and upgrades for Macs, PCs, and iOS devices, visit: http://www.newertech.com.